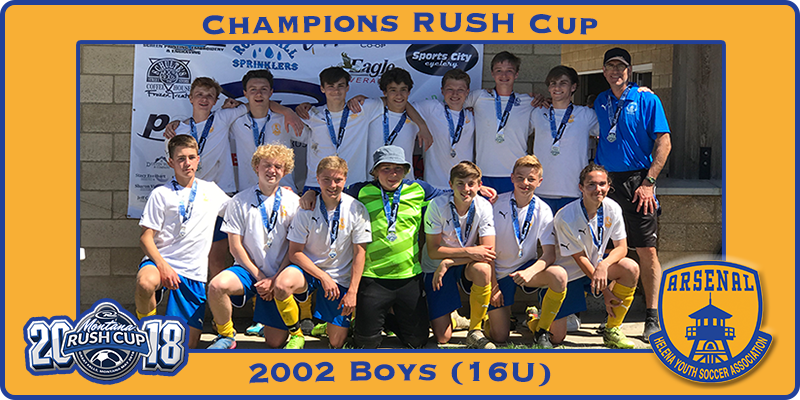 The Arsenal 2003 16U Boys team coached by Zack Walder and Andy Adamek took the Championship in the 17U Division at the Rush Cup in Great Falls on the weekend of May 12th. Arsenal outscored its opponents with 13 goals for and only 3 against through all four games. Along the way the U16 boys beat Flathead Valley United U16 Premier, Bozeman Blitz U17, and Laurel Storm U17. In the final it was a rematch with Laurel Storm and Arsenal went down 1-0 just before the half, but reorganized and quickly responded with an equalizer by Caleb Hoxie to make the score 1-1 at the end of regulation. At the end of the first of two 5 minute extra periods Aidan Adamek found the net with a go ahead goal, and Helena fended off several attacking surges by Laurel Storm in the final minutes to win the gold. Tournament standout players for Arsenal included stingy play by keeper Henry Lauerman, solid leadership and back line play by Auggie Tupper, Ben Vince and Jacob Demmons, tactical midfield distribution and possession by Josh Wilcox and Caleb Hoxie, utility play by Ethan Hayes, and exhausting runs by Russell Wells. In the final third Ryan Quinn displayed creativity leading to a hat trick in game 2.